With the nine-year-old Uphaar Tragedy case reaching its last stage, the CBI has engaged former Solicitor General of India and noted Supreme Court lawyer Harish Salve to open the final arguments in the case. A national taekwondo player has alleged she was gangraped repeatedly for the past six months and continuously subjected to blackmail by her coach and three others. The police here have registered a case against coach Subhash Tyagi and Dharampal, Pratap and Mahesh. Taking shelter behind the Allahabad High Court’s order to ensure safety of Reliance Energy’s property in Dadri, the state government has banned ‘Dadri March and Rally’ scheduled to be organised by former Prime Minister V.P. Singh and Chairman of Jan Morcha, MP Raj Babbar, tomorrow. Arjun Singh may be repairing or rectifying the faults in the power supply here as part of his duty as a lineman in the Power Supply Department of the state, but he and his family are among several families of Bhadshahpur village in Faridabad sub-division, who had been living in darkness for the past about 26 days. A girl who had eloped with a man a month back, was allowed by a Delhi court to go home with her husband after she expressed a desire to live with him and said she married him of her own will. Industrialists here have shown an inclination for using bio-diesel, especially to run their machines in factories in order to raise their productivity and profit. The opinion loaded in favour of the use of bio-diesel was expressed here by a number of industrialists at a presentation on the comparative usefulness of the bi-product in Raman Kant Munjal Hal of Gurgaon Industrial Association (GIA). In this school run by the Municipal Corporation of Delhi, toilets are neither missing nor non-functional; in this school it is the classrooms that double up as toilets. In a shocking report put together by NGO, Right to Education Task Force (RETF), girl students in MCD School, Shri Ram Colony in North East of Delhi are made to use a corner of the classroom for relieving themselves and for washing hands. With the arrest of Raj Kumar, resident of Prem Nagar in Sultanpuri, the North-West Delhi Police claimed to have solved a blind murder case of one Sriniwas of the same locality. Janmashtami, the birthday of Lord Krishna, was celebrated across temples and many households in the Capital with devotion and fervour amidst chanting of hymns and songs to eulogise the Lord. The devout gathered at temples dedicated to Lord Krishna including the ISKCON temple and Birla Mandir where religious fires were lit as priests and devotees chanted hymns from ‘Srimad Bhagvat’, which describes the incarnations of Lord Vishnu. Janmashtami is celebrated with great devotion on the eighth day of the dark fortnight in the month of Bhadrapada across northern India. 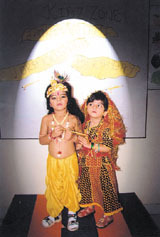 Children dressed up as Radha and Krishan on the occasion of Janmashtami. With the arrest of four dreaded dacoits Rajesh, Raj Kumar, Anil and Raju after a brief encounter, the North-West District Police have claimed to have busted a dreaded gang which was planning to commit dacoity in broad daylight at a petrol pump in the Mangolpuri area. A former woman councillor was shot dead in Sahid Nagar in Sahibabad last night. The victim, Ms Noorjahan, 45, who was also working as a realtor, was living in House Number 350 in B-block of Sahid Nagar. Last night at around 10 pm, when Ms Noorjahan was returning home from Telephone Exchange Road, she was accosted by two young men. The INLD, led by the former Deputy Speaker of the Haryana Assembly, Mr Gopi Chand Gehlot, today took up the issue of the alleged denigration of the national flag with the Governor, Dr R. K. Kidwai. A Memorandum of Cooperation (MoC) has been signed between the Ministry of Power, Government of India and Indira Gandhi National Open University (IGNOU) for capacity building in the Indian Power Sector. The police have filed a chargesheet against a man accused of selling obscene MMS by downloading them from computer in North-West Delhi. According to the chargesheet filed before Metropolitan Magistrate Deepak Garg, the accused Sandeep Jain who ran a shop in Sector 16 of Rohini, used to sell obscene MMS through memory cards of the mobile phones. “The CBI has requested me to open the final arguments in the case as I had represented the agency earlier in this case during the framing of the charges,” Mr Salve said, adding that he would be appearing ‘pro bono’ (free of charge). “This is the first case in India that the investigations have gone into the activities of those right at the top. Usually, the probe ends with the cornering of staffers and other inconsequential persons. Due to this we have to thoroughly examine the slotting of the charges against the accused. This is a very complex case,” he added. Asked if the destruction of numerous documents regarding the case would harm the final result, Mr Salve said the testimonies of a total of 191 witnesses would prove to be of great importance and help tide over such losses. “The Uphaar Families’ Association has done a great job in keeping the case ticking. The fact that the case has reached this stage is largely due to them,” Mr Salve said. Additional Sessions Judge Mamta Sehgal, who closed the defence evidence of the case on August 2, has posted the matter for tomorrow to decide the dates of the final arguments. The court would also be visiting the site of the cinema hall later this week. Fifty-nine persons trapped inside the Uphaar Cinema hall died of asphyxia when a fire broke out during the screening of the Hindi movie ‘Border’ on June 13, 1997. Of the 16 accused originally named in the case, four have already died during the pendency of the trial. The remaining 12 accused, including the owners of the cinema hall Sushil and Gopal Ansal, have been variously charged with offences like Sections 304 A (causing death by negligence), 33 (causing hurt by act endangering life or personal safety of others) and relevant provisions of the Cinematograph Act, 1952. “Our fight is not only for the children who died in the fire but also for the next generation... for their safety. For this, we are happy to get whatever help we can,” Neelam Krishnamurthi, whose two teenaged daughters died in the tragedy, said. Although the case was registered in Sector 5 police station, the lid was blown today. The victim hails from this city. Her parents refused to make any comments as the matter is under police investigation. The victim has mentioned in the FIR that she did her schooling from Janaki Dev Mandalia School in Pilani. Later, she did her BSc from Manadalia College in Jhunjhunu. Simultaneously, she majored in taekwondo and became a national player. The FIR further says she came to Gurgaon on May 15, 2005, after completing her BSc course and got in touch with coach Subhash Tyagi. She wanted to do BEd. But the coach prevailed upon her to do MSc, which she heeded to. Later, she wanted to marry someone. When she sought counsel from the coach on the issue, he dissuaded her on the ground that it would ruin her martial art and sports career. Thereafter, the coach asked her to meet him in Yogi Hostel in Jhunjhunu. When she visited the hostel, she was photographed in unseemly poses and gangraped by him and the three others named in the FIR. Thereafter, she was threatened by the coach to do his bidding. The gang used to call her to Jhunjhunu or in Gurgaon and she was often raped. This had been happening since the past six months. She alleged she was being blackmailed all these months. The matter came to a boil when she was gangraped by the four in Gurgaon on August 13. The police said a team had already been sent to Jhunjhunu for arresting the four accused. Divisional Commissioner, Meerut, Dev Dutt and I. G. Meerut, N.B. Singh, told the media that the Allahabad High Court had issued this order on a plea by Reliance Energy, the company that is to build a Mega Power Project at Dadri. The Divisional Commissioner said that Section 144 had been clamped in the whole area and some 84 persons had been detained while warrants against 273 persons who were reportedly tried to reach the prohibited rally ground in Dadri had been issued. Meanwhile, according to sources the Samajwadi Party cadres have also spread in villages throughout the area. Among the persons who have been banned from reaching the rally ground in Dadri are former Prime Minister V.P. Singh, Raj Babbar, Ram Chander Paswan, Kesri Singh Gujjar, Bhagwan Jatav, Ms Medha Patekar. Mr Dev Dutt said he had confirmed information that no union minister was coming. Adequate arrangements have been made by authorities to detain the VVIPs, VIPs and others according to their status. 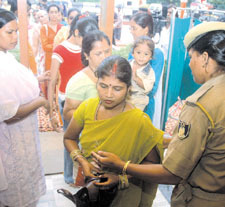 Even temporary jails in Ghaziabad and G B Nagar have been arranged. The VIPs would be detained in guest houses, the officials said. All entry points to Dadri would remain sealed for August 16 and 17. Some traffic arrangements have also been finalised. Traffic between Dadri and Bulandshahr and Ghaziabad has been prohibited. Inspector General of Police, N.B. Singh said adequate police and other forces had been deployed to control the crowd and any untoward incidents. District Magistrates and SSP’s of Ghaziabad and GB Nagar were also present along with DIG police, Meerut range. Arjun Singh may be repairing or rectifying the faults in the power supply here as part of his duty as a lineman in the Power Supply Department of the state, but he and his family are among several families of Bhadshahpur village in Faridabad sub-division, who had been living in darkness for the past about 26 days. The reason being the damaged transformer that has not been replaced despite several complaints made to the authorities concerned. This is not the only village that is facing such situation, but almost in every village, damaged transformers are very common, according to sources in the department. The residents of Harijan (Dalit) Mohalla of Bhadshahpur village claim that the transformer in their locality had got burnt down about 26 days ago and the matter was reported to the office concerned of the Dakshin Haryana Bijli Vitran Nigam (DHBVN). But till date nothing has been done in this regard. The village has about three transformers and one of these was repaired only a few days ago. Angry residents of Fatehpur Billauch village of Ballabhgarh subdivision had recently torched a transformer and had damaged the sub-station located at the village in protest against the poor supply and maintenance. Though there had been a direction from the top authorities that a damaged or burnt transformer might be replaced within 48 hours of the complaint, but a majority of such complaints in the rural areas were attended slowly, said an officer of the department. Besides, there are also several subdivisions in the department, which can attend to the complaints, but still villagers have to face several power problems in the district. According to the officials, there is no storage facility for the new or ready to use transformers in the city or the district. The Nigam has closed down its own workshops where transformers could be repaired and the department has now been hiring private parties or contractors to do this job. It is also alleged that the use of substandard material often leads to early or premature damage to transformers. According to experts, several other factors can also cause damage to transformers, which include overloading, ill-maintenance and staff shortage. There has also been a shortage of over 1000 posts in the department. At least 250 linemen were required to repair and maintain the equipment and the power lines, claimed a spokesperson of the All Haryana Power Workers’ Union. He demanded that all the posts lying vacant for the past over ten years be filled. The girl’s father Issar Ahmed had lodged an FIR at the Uttam Nagar police station on July 26, alleging that his 17-year-old minor daughter had been kidnapped by one Bhagwan Singh. However, Metropolitan Magistrate Deepak Garg allowed the girl to go home with Singh after she stated that she had willingly married him and wanted to live with him. “The girl has come from the custody of the respondent (accused), she has to go in the same custody. More so, because the girl wants to go with her husband,” the court observed. Earlier, the court recorded her statement under Section 164 of the Criminal Procedure Code (CrPC). In separate applications moved before the court, the girl’s father and husband both had sought her custody. The police had registered cases against Singh under Sections 366 (abducting a woman to compel marriage) and 363 (kidnapping) of the IPC. The presentation was made by a private firm specialising in growing of Jatrofa tree--considered to be the best and cheap source of bio-diesel--and also application of bio-diesel in vehicles and industrial machines and equipment. Speaking on the occasion, the president of GIA, Mr V.P.Bajaj, said that considerable research on the source and viability of bio-diesel, emerging as the replacement for petro-diesel, the world over was under way. Bio-diesel, manufactured from Jatropha and other vegetable oil, is considered to be the answer as an alternative to petro-diesel, especially when petrol and its kindred products whose cost are threatening to hit the roof. The general opinion of the participants at the programme was that India, which is on the fast track on modernisation and aspiring to enter the club of 'developed' nations, must have an independent source of diesel to meet any contingencies. Experts said that Jatrofa was a kind of tree which could grow on any kind of land without much water. With the official figure cited at the presentation of about 150 million hectares of wasteland existing in the country, it was the opportune time to go in for Jatrofa plantations to create wide base for extraction of their oil to produce bio-diesel. They also saw virtue in use of bio-diesel whose usage does not emit green house gases in the atmosphere. And the administration’s explanation for this inhuman practice is simply callous. When the RETF volunteer, Mr Bhushan Jain, questioned a teacher about this practice, he dismissed them as “children of terrorists who know nothing about cleanliness…it is terrifying that the teachers can treat small children in such a brutal way,” said Ashok Agarwal, convenor of the RETF. The report says the school, where the girls are taught in the first shift do not have even a single female teacher. To cap it, there is no provision for collecting refuse. Consequently, the school resembles “a garbage pit”. “We found garbage was piled up not just in the play ground, but in the corner of each classroom. A school that has an actual strength of 1,800 children has only one old ailing sweeper,” said Mr Agarwal. The NGO claims it was approached by the parents and community-based voluntary groups Navjagriti and Navjyoti to inspect the school and take up the issue with the authorities. “There is no arrangement for teachers to sit, the attendance of the children is poor, the quality and quantity of food is inadequate and though the school starts at 7.30 in the morning, the teachers come to school only after they hear of the inspection. But on paper they are shown to be punctual,” Mr Agarwal said. The report alleges that parents have to pay anything between Rs 200 and Rs 900 to get their children admitted in the school. “The school has also been charging fees from some students who have been studying there for the past couple of years, but still has no records of these children. What is appalling is that a teacher even introduced himself as a press reporter to Mr Bhushan,” regretted Mr Agarwal. The report further alleges that instead of the mandatory 180 gms of mid-day meal per child, students here are provided food, which is merely 40 to 50 grams. The report says the mid-day meal is barely sufficient for 400 children, but is distributed among 1,200 children. According to the police, “Information of a body lying in a plot near Mubarakpur village was received in the morning of July 31. The local police rushed to the spot and found that a body with slit throat is lying in a pool of blood. It was a blind case as there was no clue. Immediately a team under the supervision of the ACP Kumar Gyanesh was constituted,” said a senior police officer. “The team interrogated more than 100 persons linked to the deceased. Then we zeroed in on at one Raj Kumar. His mobile phone record was examined. Finally, Raj Kumar broke down and confessed to have committed the murder with the help of his associate Sujeet. Raj Kumar allegedly had relationship with the wife of the deceased. Raj Kumar stated that he wanted to marry Bindu, wife of the deceased,” he said. Janmashtami, the birthday of Lord Krishna, was celebrated across temples and many households in the Capital with devotion and fervour amidst chanting of hymns and songs to eulogise the Lord. The devout gathered at temples dedicated to Lord Krishna including the ISKCON temple and Birla Mandir where religious fires were lit as priests and devotees chanted hymns from ‘Srimad Bhagvat’, which describes the incarnations of Lord Vishnu. Janmashtami is celebrated with great devotion on the eighth day of the dark fortnight in the month of Bhadrapada across northern India. The Akshardham Temple here has organised a musical ballet depicting the life of the Lord from his birth which will culminate at midnight, when Krishna was born. Devotees keep awake, sing bhajans and fast till midnight, and eat only after the birth ceremonies. At the stroke of midnight the idol is bathed in milk amid chants of ‘Om Namo Bhagvate Vasudevaya’ the devout offer flowers and the idol of baby Krishna is rocked in a tastefully decorated cradle. A ‘mahaabhishek’ would be performed at the ISKCON temple in East of Kailash locality in south Delhi where a huge number of devotees are expected to congregate. Security was tightened at temples across the capital with Delhi Police installing metal detectors at Birla Mandir, ISKCON and Akshardham temple in view of intelligence inputs warning of terrorist strikes. A high alert was declared in the capital ahead of Independence Day which will continue till tomorrow. The gang has a criminal history of more than 100 cases, including attempt to murder, assault on police party, snatching, etc. Three countrymade pistols, cartridges and one knife have been seized from their possession. Stolen goods worth Rs 1.5 lakh have also been recovered. Acting on the tip-off, a team was set up which rushed to the spot and challenged the desperados. One of them fired at the police party. The cops then overpowered four criminals. One of them pulled out a revolver and shot her in forehead. She died on the spot. According to the police, property dispute is suspected to be the reason behind the murder. Noorjahan’s mother-in-law, Rashidan, has filed an FIR in this connection. Noorjahan had won the municipal elections in 1995 as an independent and served as a councillor in Ghaziabad Municipal Committee. Her husband Meherban had expired 11 years ago. The police have been deployed in Shahid Nagar in the wake of tension prevailing in the area. In a memorandum to the Governor, the INLD leaders, including Mr Gehlot, alleged that during a cultural programme, which was part of the Independence Day celebrations here yesterday, schoolchildren wore colourful outfits which had the Tricolour and Ashoka Chakra printed on them. The Ashoka Chakra, in the outfits of many children, came on or below the knee. Incidentally, Mr Gehlot was elected to the Haryana Assembly from the Gurgaon constituency. The INLD has urged the Governor to take action against those involved in denigrating the national flag in this fashion and hurting the patriotic consciousness of the people of the state and the country at large. This collaboration envisages laying the foundation for cooperation and joint action to support the development of educational programmes in Power Distribution Management, Rural Energy Management and related areas. The MoC will also help establish a national network for joint collaboration for skill and capacity development, providing for sharing of academic experiences between IGNOU and the MoP, developing strategies for design, development and implementation of various training, professional development and general awareness programmes with suitable entry and exit points. In a statement released here, IGNOU said the MoC marks yet another milestone in the march of IGNOU towards providing opportunities of higher education and continual professional development to a large segment of hitherto-unreached learners. “He used to show the obscene films to the customers and as per their demands used to download them in their mobile phone memory cards,” it was stated in the chargesheet. Jain was arrested on July 19 last under Section 292 (sale of obscene books etc) of the IPC following a raid at his shop.